Some time ago, I asked many of our family member's to fill out a Family Questionaire, so I may add their section of the family to the book I'm making about The Falzini Family. I'm also still requesting that family members contact me if they have any photo's of The Falzini's, so I may include them in my book. If you have any information on our family which you think may prove useful to my researches, or you would like to take the time to assist in our researches, please contact us at our e - mail address. At this time I'm still missing information on the daughters of David Falzini Sr. If you would like to help, please contact me at my e mail address. In this section, we will give credit to where we were able to research the material of our family from ! Paolo Canalini, Roberto Canalini, Alessandra Falzini, Andrea Falzini, Anthony Falzini, Barbara Falzini, Carol ( Falzini ) Ganofsky, Fabrizio Falzini, Riccardo Falzini, Robin ( Falzini )Vankannel, Yolonda ( Falzini ) Smith, Lido Paglia, Rose ( Paglia ) Weaver, Marlene ( Falzini ) Zito. We are also researching the other family's that married into The Falzini family, and I will list those names here, If you share that last name, please contact me with your information! Thank you ! Source: Cleveland Press; Cleveland Necrology File, Reel #107. Notes: Falzini, Romolo, beloved husband of the late Emily, dearest father of Mrs. Phyllis Paglia of Las Vegas, Mrs. D. Ferritto of Solon, O., Mrs. Nick Gonzales of Miami, Fla., Rudy, Romeo, Tony, Dave grandfather and great-grandfather, passed away suddenly. Friends received at Joseph J. Vita Funeral Home, 7348 Broadway. Services Wednesday, Oct. 31st at 9 a. m., from St. Monaco's Church, Rockside Rd., Garfield Heights, Interment Calvary Cemetery. Notes: Falzini. Romeo Falzini, beloved husband of Ida (nee Mancini), dearest father of Ronald, Raymond and Romilda, dear grandmother of Ronald, Jr., Kenneth, Deborah, dear brother of Rudy Philomena Paglia, of Las Vegas, Nev., Anthony, Helen Ferritto, David, Patricia (Pat) Gonzales of Florida, entered into rest Feb. 12. Friends received at the Joseph J. Vito Funeral Home, 6130 Turney Rd. Services Wednesday, Feb. 16 at Holy Name Church at 10 A.M. Interment Calvary Cemetery. Visiting Hours 2-10 P. M.
Notes: Falzini. Jacqueline Falzini (nee Talani), beloved wife of Robert, dearest daughter of Joseph and Norma (deceased), dear sister of Lois Soukup of Valley View, O., dear aunt of Dawn, Albert Wendy and Chet, niece of Mrs. Lenora Miller and Mr. and Mrs. Robert Fastick, entered into rest Tuesday, Apr. 21. Friends received at The Joseph J. Vito Funeral Home, 6130 Turney Rd. Services Saturday, Apr. 25, at 9:30 a.m. Visiting Hours Friday 2-4 And 7-9 P.M. Family suggests contributions to be made to the Cancer Fund. Notes: Falzini. Ida Falzini (nee Mancini), beloved wife of the late Romea, dearest mother of Ronald, Raymond, Romilda (Emily) Bertolone, dear daughter of Ybaldo (deceased) and Catherine Curcio, dear grandmother of five sister of Fannie Scoppa Edio Mancinl, Mildred DePalma all of Detroit, Mich. and George Mancini, entered into rest Saturday, Dec. 8. Services Tuesday, Dec. 11, at Holy Name Church of 9 A.M. Friends received at The Joseph J. Vito Funeral Home, 6130 Turney Rd., Monday 2-4 And 7-9 P.M.
Notes: Falzini, Erma Rose, wife of the late Edward, mother of Yolanda Smith, Mary Wolff, Edward, Carol, and Richard Falzini, and grandmother, daughter of Alexander and Kathleen Szabo, passed away Friday. Friends received at the Donald B. Johnson Funeral Home, 521 Broadway, Bedford O. Services at St. Pius X Church, Warrensville Center Rd., Bedford, O. Monday, Aug. 8, 1955, at 10 a. m.
Source: Plain Dealer; Cleveland Necrology File, Reel #024. 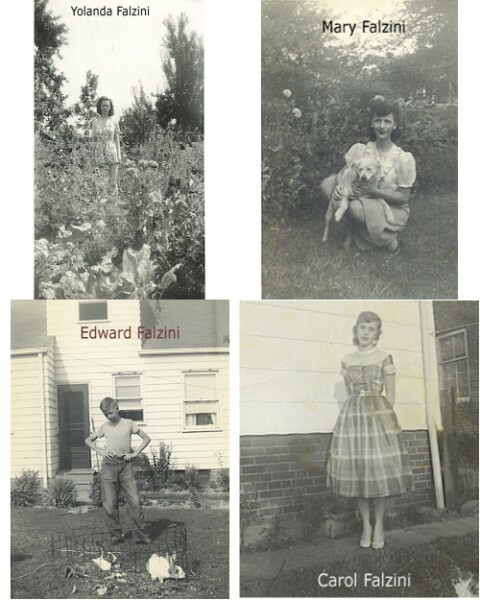 Notes: Falzini, Edward, beloved husband of Erma; father of Mrs. Edward Smith, Mrs. Warren Woff, Edward, jr., Caralyn, and Richard; passed away Nov. 28. Friends may call at Donald B. Johnson Funeral Home, 521 Broadway, Bedford, O. Services at St. Mary's Immaculate Conception Church, Bedford, O., Tuesday, Dec. 2, at 9 a. m.
Source: Cleveland Press; Cleveland Necrology File, Reel #024. Notes: Falzini, Pfc. Albert, beloved son of Romolo and the late Emily, brother of Edward, Philomena Paglia, Rudolph, Romeo, Anthony, David, Helen Ferritte, Patricia Gonzales, killed in France in action, June 7, 1944. Memorial mass services will be held June 7 at 7:30 a. m. Holy Name Church. Notes: Falzine, Emily--Beloved wife of Romole, mother of Philomena Paglia, Helen Floreto, Pauline Gonzelis, Edward, Rudolph, Romeo, Anthony, Albert and Davis, passed away suddenly at residence, 7815 Rosewood ave. Funeral Thursday, Aug. 21, from Holy Name Church at 10 a. m. Burial Calvary Cemetery. In 1837, Beniamino Falzini, ( 1792 - ? ) rented the prison rooms, ( part of The Falzini Castle ) to the comune. At this time we don't know if Beniamino was in possesion of just part, or the whole castle. Antonio Falzini, ( 1906 - 1948 ) is buried in a Noble Tomb, It is the family tomb of The Miselli Family. At this time, we don't know the connection between the The Falzini's and The Miselli's. Romolo Falzini, arrived in America on May 15, 1909 with only $16.00. His brother Remo arrived on September 26,1912 with $60.00. He was going to his Brother - in - law's Vittorio Laurenti. Romilde, wife of Romolo Falzini arrived on November 7, 1910 with $25.00. She was escorted to America by her brothers Antonio and Pietro Pampanini. Paolo Falzini ( brother to Romolo ) arrived on March 15, 1913. He had 40.00 with him. Nello Falzini ( brother to Romolo ) arrived August 27, 1913 He had $8.00. with him. Here is a map of Castelnuovo di porto, and some of it's surrounding villages, such as Formello, Morlupo and Riano. Percorso: "Da Roma: prendere la Flaminia. Al Km 27.700 girare a sinistra, percorrere circa 50 mt e si giunge al centro aziendale."